For awhile now this repair was on my to do list and i've started with the best source of all: the internet. 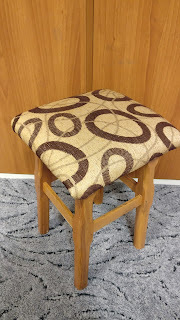 After reading several post about upholstery and watching videos on youtube i've put together a shopping list: foam and batting were the missing parts for this project.The fabric i've used was an leftover from another project. 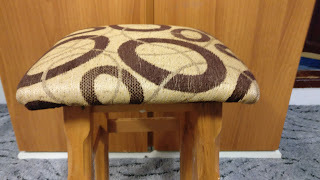 The first step for me it was to remove the staples, because in my country the construction of a chair is different from what i have seen on internet - the top is not removable. 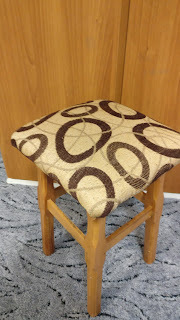 Depending from where you are from the first step may be removing the top part from the chair - this will make this project easier because you wont have to move the chair when your stapling it. For this part i've used a flat head screwdriver and needle nose pliers, with the screwdriver i was lifting a bit the staple and with the needle nose pliers taken it out. After removing all the staples from the chair top i've laid down the foam that i've got from the bricolage shop and marked it with 3 cm overhang. To cut the foam at the dimension that i needed i've used a new utility blade and the ruler as straight edge. Using this method i've got really clean cuts. At this point i've cutted also the batting and the fabric. Both of them were bigger than the piece of foam that i've cutted earlier. - to staple the fabric i've started from the middle of each side and work my way towards the corners. The corners were a little trickier to do but with patience they are doable.